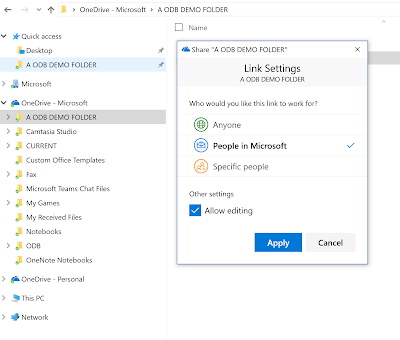 Its really important to note that this was demo'ed in the Windows File Explorer on the desktop, not in the web browser! 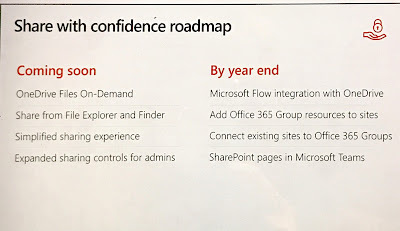 This was actually announced last week at Microsoft Build 2017 but I think showing it in the context of SharePoint Online is also really important. OneDrive for Business is my place, as a user, to store and manage files that I'm working on and might not be ready or appropriate to share with a team. 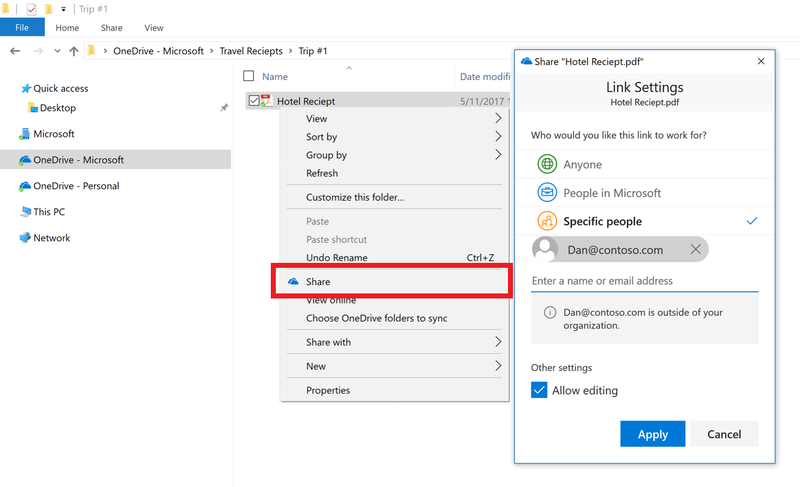 However, OneDrive for Business plays a very important sharing role in my organization in that it also allows me to share my files with anyone. Having better tools to manage what is and is not in OneDrive for Business and allow me to share directly from my desktop, allows me to view and manage my content more easily, allows me to share with others more directly, and therefore allows me to better manage what I have and have not shared. The sharing experience has been simplified, so you can share a file or folder with specific people or send a link that enables anyone who needs access, inside or outside your organization. In addition, you can now control how long a link provides access, and you can easily view and modify the permissions you have granted. 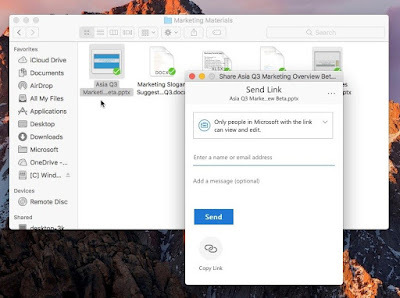 The new sharing experience is the same, whether you share on the web, in Explorer on Windows 10 and Windows 7, or in Finder on Mac. So this feature truly is one of my favorites for today's summit! I'm almost inclined to say 'It's about time! ', but I won't go that far! 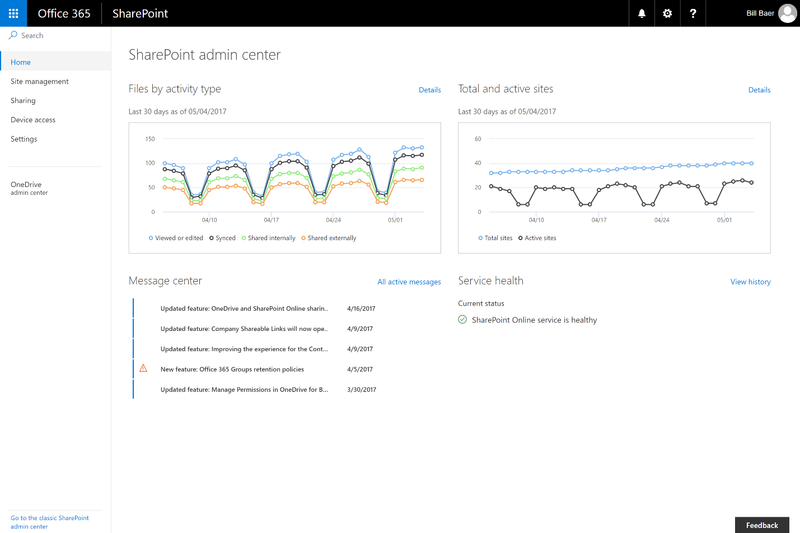 :-) Microsoft announced the new SharePoint Admin Center, which will begin rolling out in the 4th quarter of 2017. From the homepage, you can see how much more interactive and useful it is, with a Service Health dashboard designed specifically for the needs of SharePoint administrators, interactive usage reports and message center posts. 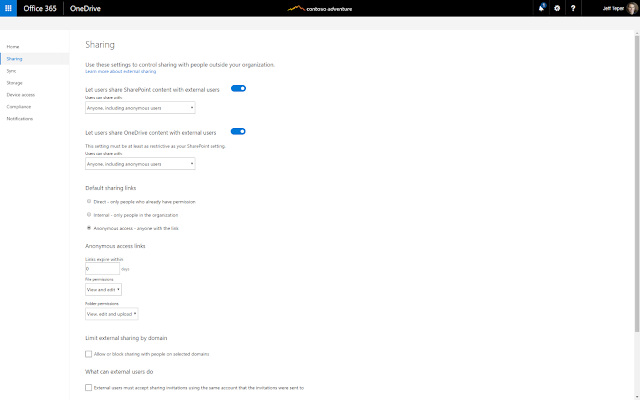 You can easily work with the many SharePoint settings that are available to configure sharing, access and the service generally. the new dynamic site management page lets you view, filter and edit the configuration of all of your SharePoint sites, including those connected to Office 365 Groups (finally!!). 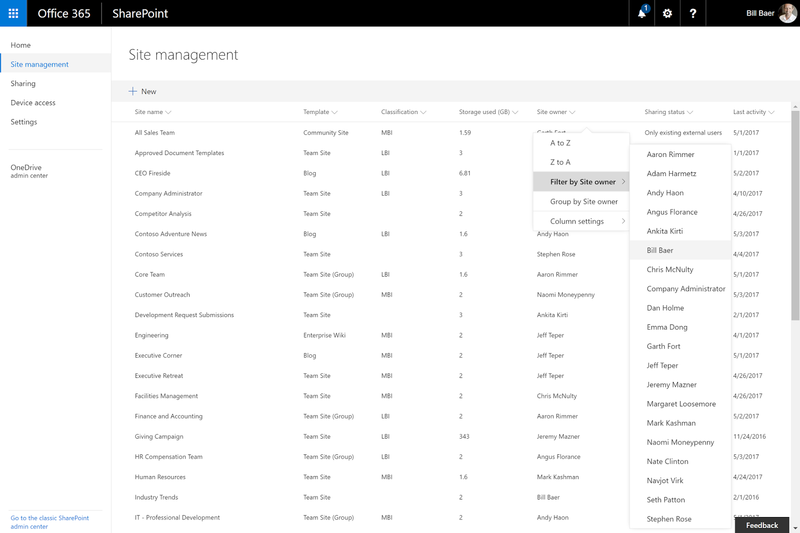 I cannot wait to start using this new SharePoint Admin Center!!! Over this last year, Microsoft has provided some great new capabilities to configure access controls for how SharePoint Online sites are shared. These options allow us to control access based on network location (by specifying IP address ranges), domains (either block or allow), use of modern authentication, forcing a user to accept a sharing invitation from the same address it was sent to, permissions allowed on files and folders, types of links, expiry of links and whether devices are domain joined or not (with the help of InTune). 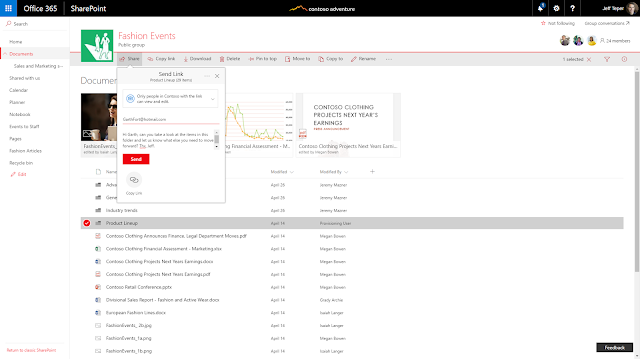 These have been very helpful, but they have been primarily configured from 1 admin console page and apply to all SharePoint sites. 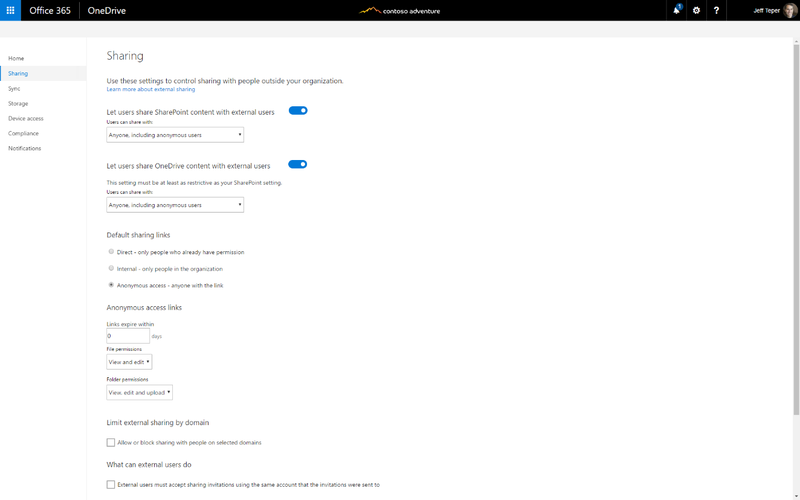 Today's feature announcements will allow us to configure these settings different for each site. This allows us to get more specific about how sharing is permitted for each individual site, which is a very welcome improvement! We often have different sites created for different purposes or audiences, which require different sharing settings or access controls. 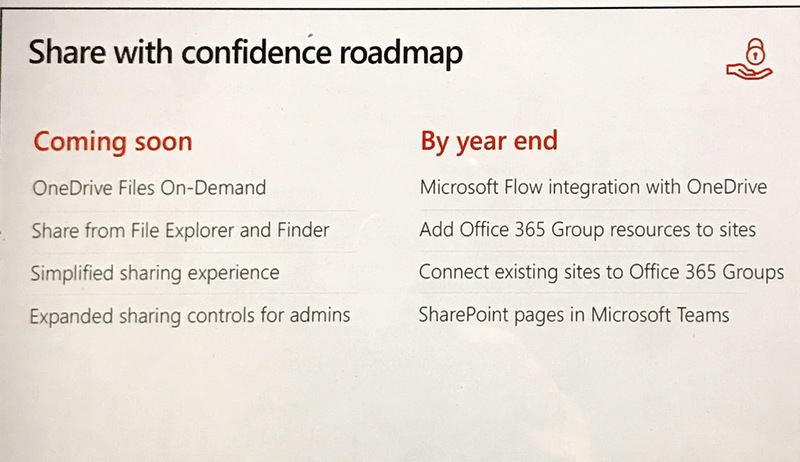 Check out the SharePoint Team's blog with the full set of announcements here: https://blogs.office.com/2017/05/16/new-sharepoint-and-onedrive-capabilities-accelerate-your-digital-transformation/. This is a truly great event with so much useful information shared! I am so very impressed at how Microsoft continues to innovate in this space to continually bring us new features and value to help us improve the security of our Office 365 and SharePoint Online environments! When you are facing the problem of file sharing by using the internet resources then this is the best file sharing site which is use for sharing the files online easily. By using this website you can easily share your any type of website on the internet. Was looking for this guide every where but since I was busy with my work I couldn't search for it anymore. Glad I found it on your blog and I can now work in peace.